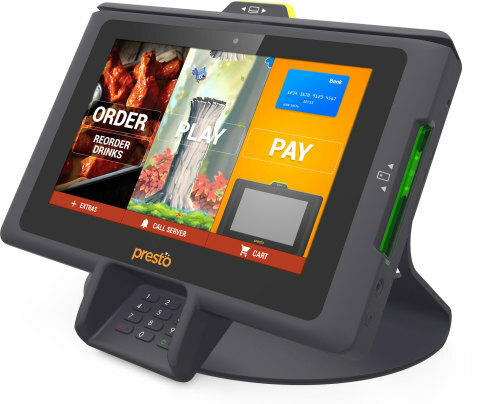 REDWOOD CITY, Calif.--(BUSINESS WIRE)--E la Carte, Inc., creators of the Presto™ System for full-service restaurants, today announced its state-of-the-art next generation product, the PrestoPrime EMV Terminal. The PrestoPrime EMV Terminal is the best pay-at-table experience available on the market, with the highest levels of security available along with future-proof capability and unparalleled guest and server ease-of-use. In the wake of more frequent data breaches, EMV liability changes and increasing rates of identity and credit card fraud, restaurants and retailers are upgrading payment systems to improve security and reduce costs. The new PrestoPrime EMV Terminal allows guests to use any form of payment they want to rapidly check out at the table at their convenience, without ever giving up physical control of their cards. E la Carte will be demonstrating its new PrestoPrime EMV Terminal at industry-renowned event, Restaurant Leadership Conference on April 9 - 12 in Phoenix, AZ. To learn more about the PrestoPrime EMV Terminal, visit: www.elacarte.com or email us at info@elacarte.com. E la Carte, developers of the PrestoPrime™ EMV Terminal and Presto EMV System, leads the table-top dining revolution with its guest-facing, pay-at-the-table, e-commerce system. Installed in over 1,800 restaurants across the nation, including Applebee’s (a division of DineEquity, NYSE:DINE) and selected Outback Steakhouse Restaurants (a division of Bloomin’ Brands, Inc., Nasdaq: BLMN), the Presto System enables restaurant guests to take greater control over their dining experience by allowing them to order from a full menu, play exciting interactive games, and pay their bill directly from the table. The PrestoPrime EMV Terminal also provides operational and financial benefits to restaurant operators which drives increased profitability, and unlocks restaurant data that was previously inaccessible, enabling smarter decisions around guest satisfaction. E la Carte’s new dual processor, secure PrestoPrime EMV system is software compatible with the current generation Presto System - more than 90,000 of which are at work every day in more than 1,800 restaurants across the United States - and includes twice the memory and four times the flash storage of the current generation, and a securely partitioned payment module that enables point-to-point encryption (P2PE) security, EMV, and multiple forms of payment, including PIN-entry payment, Magstripe, and NFC capability for contactless payment systems such as Apple Pay and Samsung Pay.